On Tuesday, 13 October in Yerevan, EuFoA hosted a conference entitled “EU and NATO – how to secure stability for Armenia and the South Caucasus”. 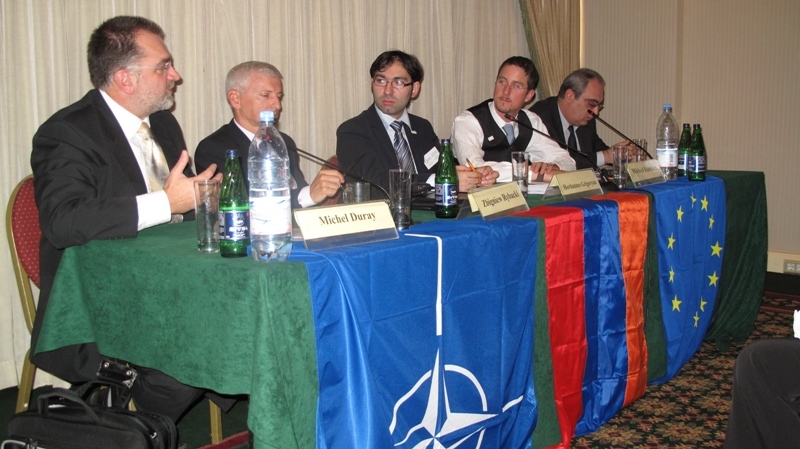 The event was organized in the framework of NATO week in Armenia, and co-sponsored by NATO. Below we provide you with two articles about the event. “The European Union and NATO wish to play a constructive role in the process of establishment of security and stability in the South Caucasus. The two structures supplement each other, participants of the conference on “The role of the European Union and NATO in ensuring security in the South Caucasus” say. Representatives of the European Union and NATO participating in the conference noted that there was a great shortage of security guarantees in the South Caucasus. Closed borders and conflicts do not allow the parties to establish common policy. The participants of the conference touched upon the issue of the Armenian-Turkish relations. According to NATO representative to the South Caucasus Zbignev Ribatski, the normalization of the Armenian-Turkish relations will contribute to the development of the Armenia-NATO relations. The EU expert considers that the normalization of those relations will become a positive example in the region. “If the parties manage to ratify the Armenian-Turkish protocols and open the border, establish diplomatic relations, it will be the first diplomatic solution in the South Caucasus after the collapse of the Soviet Union, and will become a signal for the whole region,” said Michael Kambeck, secretary general of the Brussels-based European Friends of Armenia, said. 16:18 13/10/2009 — “NATO and EU role in ensuring security in Armenia and South Caucasus” forum got under way in Yerevan today, in the frames of NATO week in Armenia. Secretary General of [European Friends of Armenia] Michael Kamback said despite their different ways of acting, the EU and NATO are willing to have a constructive role in the establishment of security and stability in the South Caucasus. “The roles make each party complete: both parties are interested to see the region politically stable and void of conflicts, hence the steps taken by each of the parties are directed to the abovementioned objectives,” he highlighted. NATO week is due in Armenia October 12-16, in the frames of Armenia-NATO Individual Partnership Action Plan (IPAP). Visits of the Alliance representatives to Yerevan, meetings, international forum, photo exhibition devoted to the Armenian peace-keepers, Yerevan-Pristina TV-bridge, other events have been scheduled, Armenian MFA reported. NATO week is one of the most significant events carried out by Armenia in the frames of RA IPAP. The event missions to represent to the Armenian society the main directions of Armenia-NATO cooperation, alliance current activity description and content.